The importance of delivering and maintaining the ‘right product’ at the ‘right time’ and in the ‘right place’ cannot be overstated and as such, each product /service within a portfolio requires timely and appropriate action if the desired outcomes are to be achieved. ‘Best practice Product Management is a ‘critical success factor’ for delivering world class products and services in alignment with planned expectations'. The PMM is a robust (Agile / Lean) management process for strategically delivering market driven Products and Services. The methodology incorporates a flexible planning framework that incorporates best practice business processes /procedures ensuring every aspect of the discipline are appropriately managed against a market driven time frame. 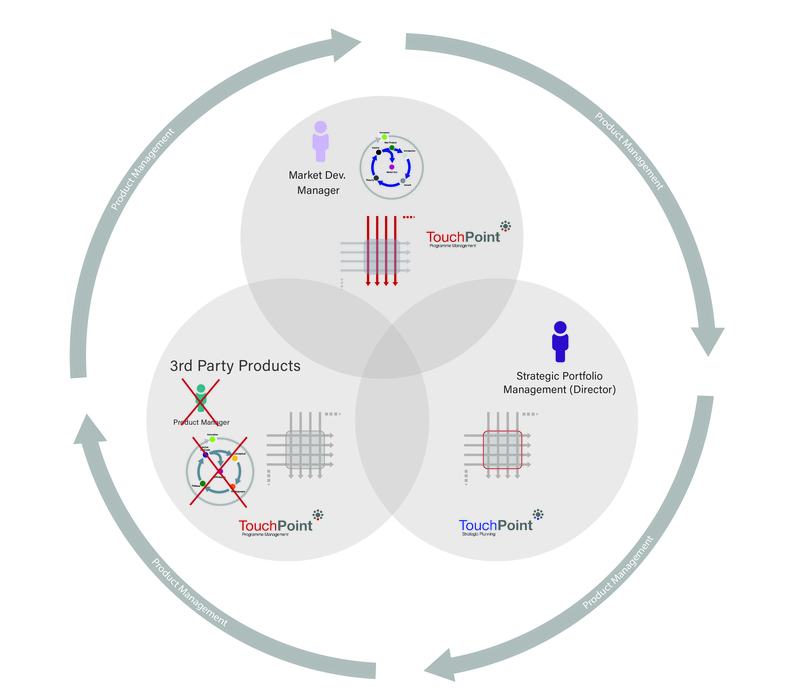 Traceable and audit-able Product Management procedures. A complete understanding of ‘what needs to be achieved’. Consistent and repeatable qualities directly associated with products. Processes that can be accurately audited. Identification and recognition of critical success factors and KPI’s. Embedded ‘market driven’ Innovation Management planning. The PMM architecture is both robust and flexible but also ensures products are managed in a consistent and professional manner. Where applicable, processes are supported by software models and associated tools which will in turn reiterate a consistent approach throughout the Product Management community. The above (diagram) PMM framework is one of four (generic) variant frameworks that successfully align the Product Management activity into a wide range of businesses. Operationally, the PMM framework promulgates an ethos of making it happen with Goals, Objectives and Strategies cascaded from the very top of the Company by the use of highly focused multidisciplinary teams, led by Product Management. As such, the product teams are wholly responsible and fully accountable for driving the Product / Service through every part of the organisation, from the cradle to the grave - in short, every functional area must know and understand what is expected from them. The above rationale will have the desired effect of making the 'Product Management' activity (...which includes the Product Manager, Market Development and Product Director) the 'contracts giver/provider' to the operational environment - this simple alignment (or re-alignment for some companies) robustly makes everything crystal clear, the outcomes of which, once implemented are nothing short of compelling. It is perhaps a bold generic statement to make, but from our 25+ years practical experience, any other Product Management alignment is simply full of compromises with many disadvantages. With the PMM alignment framework in place, each function within the Operational base plays their own part in a strategically aligned multi-disciplinary team environment. Furthermore, managing individual products or portfolio of products across their life-cycles, the strategic business programme is always under-review, this promulgates a constant desire for pro-active Continuous improvement. PMM 'frameworks' have also been developed from first principles and feature an open architectural footprint - future proof. This means you able to robustly manage a portfolio of Products / Services across individual 'life-cycles' in the knowledge that it is structurally sound and flexible enough to be rolled out across 'any' business unit. Obviously there is no such thing as a 'generic business', they come in all shapes and sizes with their own unique quirks and idiosyncrasies. As such this must be to be taken into account when deploying any management processes - it has to be right for the organisation concerned - a management process that is an incorrect fit or goes against the culture will be badly received and soon fall into disrepute. Senior management must therefore believe in the system / process with a passion and results will undoubtedly flow thereafter. 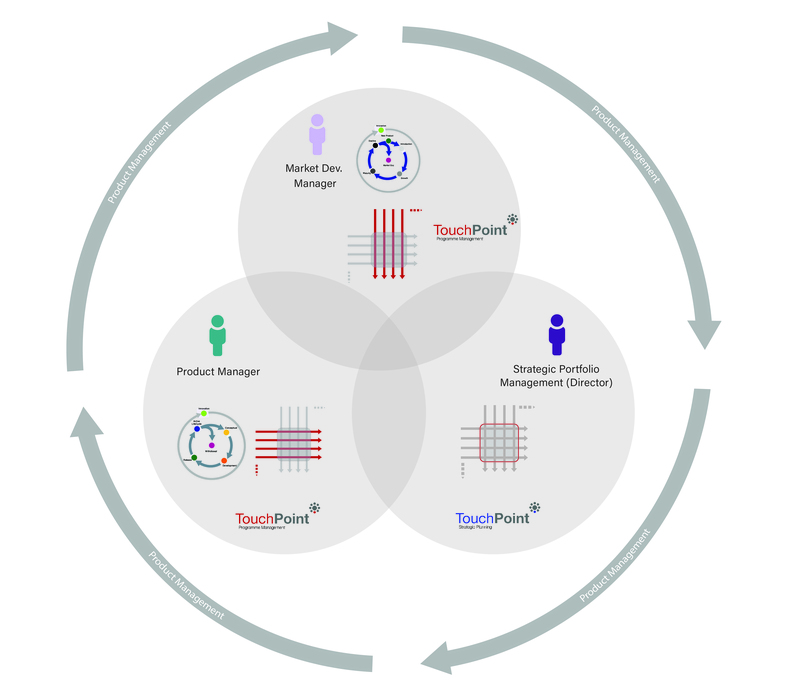 Product Management activities lie at the heart of the (Product) LifeCycle process. As the name suggests a ‘LifeCycle’ is a time related series of events managed in accordance with the requirements of an actioned strategy. Timing also plays a big part in this rationale. The ‘ethos’ of managing the Product LifeCycle is well understood (…in theory) however in practice it becomes somewhat nebulous as there are many variables to be taken into account which are not entirely under our immediate control. As you can see from the diagram below, the Innovation Phase completely surrounds the other 5 phases of Product Management and is by definition a perpetual activity - it should definitely not be seen as a 2 week 'think and sprint' prior to a new product development project. Strategically, the role of Product Management is to manage the Product across it's entire Product LifeCycle with the objective of maintaining its product position within the target market. Depending upon the market itself, this will inevitably require enhancements and tweaks that ensures it remains competitive as long as possible against competing offers. The PMM process architecture is the result of many years of research and study into the most efficient and effect way to create and manage products across their entire life-cycle. The PMM process has been designed with utmost flexibility and can be deployed as a powerful stand alone methodology or seamlessly integrated into other strategic planning processes, for example integration into the 'Business Canvas Model' enabling robust deployment of strategic objectives and critical success factors. Each of the time related phases of the PMM process have been meticulously cross mapped against an array of ‘best practice’ tools and processes (...with new tools introduced as required). Without question the PMM process simply exudes unique qualities and to instill confidence further, you can be assured that throughout the development activity we utilised resources gathered from highly respected academic studies and extensive professional experience. Agile / Lean multi-disciplinary team management approach. A professional understanding of ‘what needs to be achieved by whom and when’. 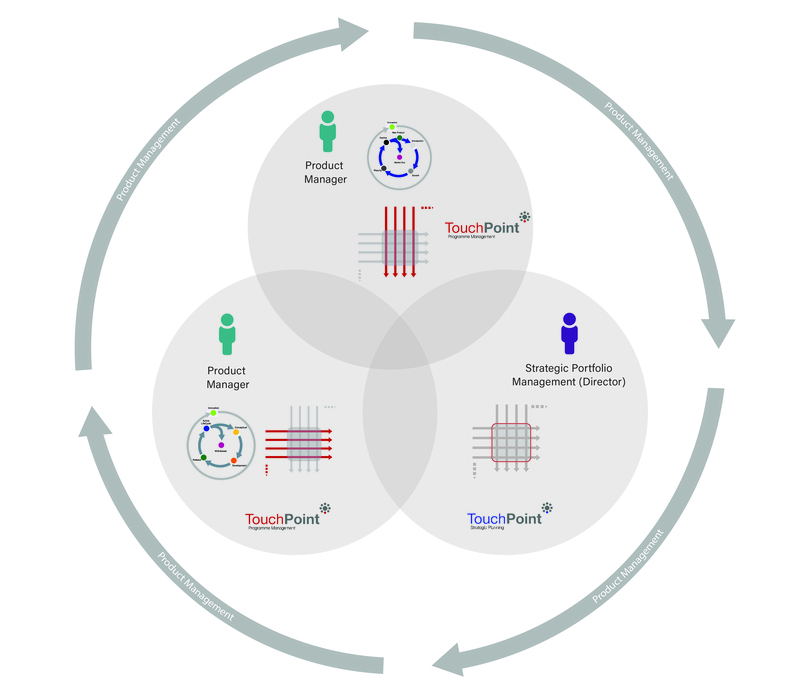 Traceable Product Management actions and procedures. Seamless integration to other best practice methods. Promotes consistent and repeatable qualities. Robust delivery of strategic intent - Management by objectives. The defined work-flow approach provides significant viability and related benefits for the CEO, Directors and Product Group Managers alike. Product plans created by the Product Manager provide continuous and consolidated reporting from the multidisciplinary team. As the product moves through the defined phases, absolute control is maintained with every aspect concerning the strategy and expected performance reported as required. The PMM™ architecture is both robust and flexible but also ensures products are managed in a consistent and professional manner. Where applicable, processes are supported by software models and associated tools which will in turn reiterate a consistent approach throughout the Product Management community. portfolio(s) which in turn align with the company’s overall strategy at all times. The workflow approach of the methodology has been specifically designed to increase the throughput of products and ensures total alignment with the overall company strategy. This ultimately results in absolutely nothing being missed or overlooked. The process architecture also ensures that the fundamental activity of managing products throughout their ‘lifecycle’ is not diluted in any way and appropriately aligns required activities. …a key success factor is a competitive organisation. Products and Services are the lifeblood of the company and as such, must be given appropriate management attention if desired outcomes are to be achieved. Each product / service within the overall portfolio will follow its own ‘life cycle’, a result of strategic intent and actioned tactical plans. The level of commercial success achieved by each product/service within the portfolio, typically relates to how well market requirements have been satisfied and directly to the ‘standard’ of ‘product management’ they have received. In a competitive environment market dynamics are constantly changing and evolving; Customers /Users are demanding products and services that align more precisely with their individual needs and requirements. This promulgates greater expectations from the product offering and it’s not uncommon to find features that were once ‘unique and exciting’ rapidly becoming ‘basic or core’ attributes within a relatively short time span. The effect is amplified if product features can easily be copied or substituted by competitor offerings. ‘Products and Services that have little or no product differentiation may be forced to compete on augmented attributes including price which may not be appropriate or desired’ From a market perspective, a continuous cycle of product / service improvements and enhancements, progressively raise the overall expectations of the customer base, which then become mandatory requirements going forward. Those involved in Product Management should be aware of these idiosyncrasies and must pay particular attention to the requirements definition process, product positioning, value analysis and the ongoing product portfolio strategy. A key role of the Product Manager is to ‘develop’ and 'manage' competitive advantage within defined commercial boundaries and targets. Innovation plays a major part in satisfying the above and requires a thorough understanding of the needs and potential solutions of tomorrow’s markets. Innovation by definition is the result of ‘applied creativity’ and requires a constant flow of creative ideas to fuel this process. Quality ideas from creative workshops are screened for their strategic fit / level of inventiveness before starting their development journey and eventually becoming the competitive advantage of tomorrow. Once achieved, maintaining competitive advantage is prerequisite to product /service longevity and should be at the strategic core of the product management activity. This in turn reinforces the need for continuous ‘innovation’ and ‘product development’ programmes. Best practice Product Management ensures that any proposed improvements and/or developments are cross functionally supported and are in total alignment with the overall strategic plan. Managing the evolution of technologies/customer needs is a critical success factor- Agility is therefore a fundamental element in Product Management. In a highly competitive market environment of constant evolution, the need for a pro-active strategic approach is vital. RADA(R) loops. The first loop is biased toward the Marketing Environment where the Product Manager is on constant watch for user requirements and any strategic objectives that are under threat. The second loop is dedicated to the internal Operational Environment and fulfills the task of optimising quality, efficiencies and costs. 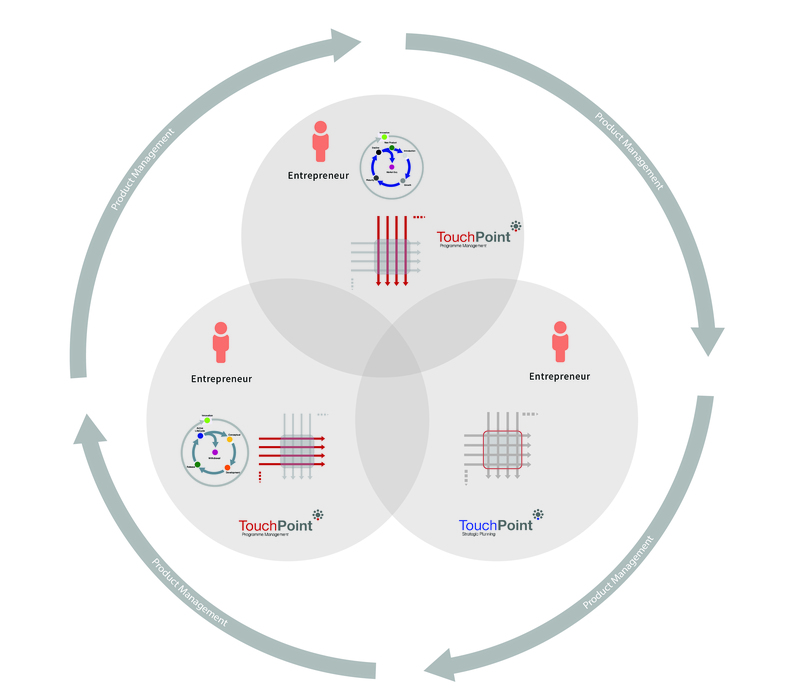 The RADA(R) loop is fully supported / integrated with the proprietary TouchPoint methods. When we developed the PMM™ process, ‘interdependencies matrices’ confirmed the relative importance of individual tools and processes throughout. It is therefore with confidence we can say that the process supports best practice in all aspects of Product Management. The above diagram indicates a route for ‘product revision’ and or ‘product replacement’, this section being brought into the process during the ‘Active Lifecycle Management phase’ in the form of a ‘Product Continuum Cycle’. This in turn places appropriate emphasis on small incremental improvements (to maintain competitive advantage) across the product lifecycle which would be in precise alignment with strategic intention and market position. Each of the process tools and process elements residing within the PMM process are all supported with business models and templates. Within each element itself is a comprehensive overview of the subject area and how any supporting business model should be used. Interactive Business Models are complemented with over 30 individual interactive business models. Each ‘element’ within the process is partnered with a specific business model, designed to help provide PM’s and Directors communicate and manage with confidence, resulting in quality strategic decisions being made. Interactive business models have been designed to be easy to use and understand yet produce a strong visual impact when presented. Needless to say the Product Manager feels eminently comfortable using them as part of their own planning activities. The business models themselves provide for suitable prescriptive comments against the concluding visual position which is then taken on board for further strategic analysis. The models are populated with your specific data and if challenged can be appropriately defended or interactively changed to meet with an agreed position (in other words the model is further calibrated with all parties buying into the final position). Note: If required, Business models can be customised to meet the specific requirements of your company / business. Business models can be purchased separately, please contact us for further information.